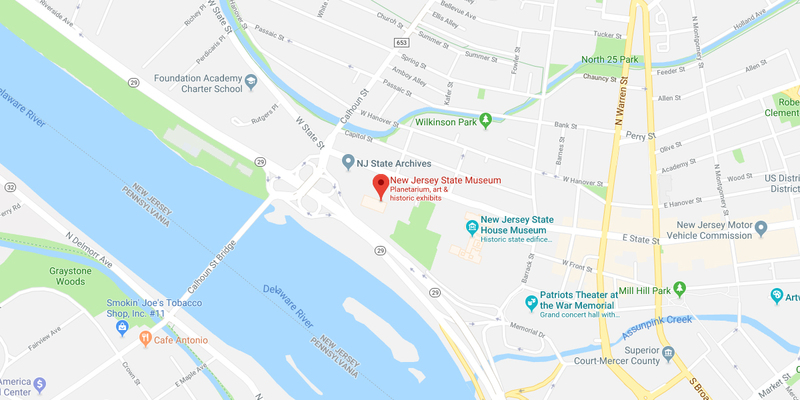 The New Jersey State Museum is located at 205 West State Street in Trenton within walking distance of the State House. It is situated overlooking the Delaware River midway between New York and Philadelphia. Museum general admission is free; donations gratefully accepted. Revenue supports the Museum’s collections, exhibitions and programs. We participate in the Blue Star program (Memorial Day – Labor Day.) Active duty military members and up to four family members are admitted free with ID. Active duty Military members with ID are free year-round. Planetarium tickets can be purchased in the Planetarium Box Office, located on the lower level. 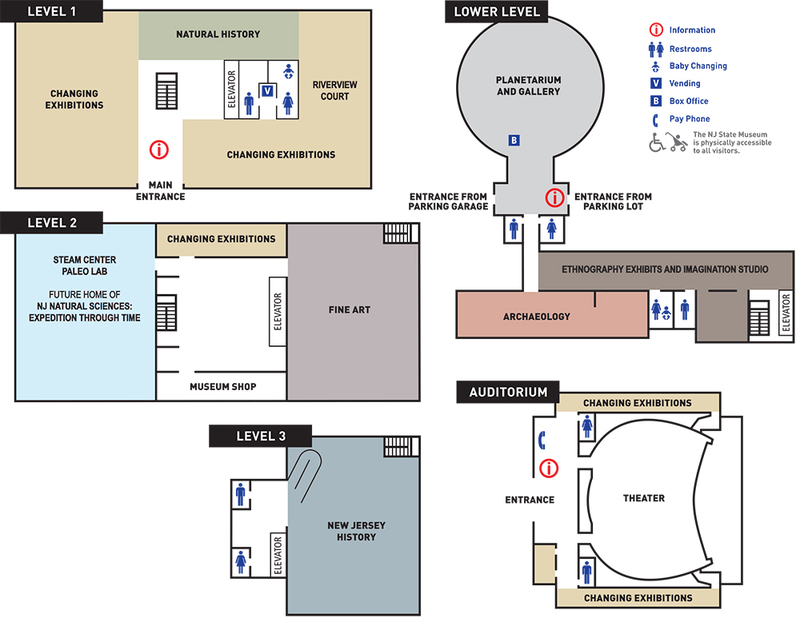 Planetarium Admission tickets includes the Museum General Admission. Please ask about our group rates, program schedule and reservation policy. Thank you for supporting your State Museum. Weekday parking is available but limited in the State House Garage. Metered parking is available on West State Street. Artworks – Trenton’s downtown visual arts center located in a historic renovated building next to Mill Hill Park – promotes artistic diversity by fostering creativity, learning and appreciation of the arts. Art classes, exhibitions and events, make art an accessible experience for all. Classes and workshops in a wide variety of visual arts media are offered year-round for children, teens and adult. The school has artist-in-residence studios, art history lectures, monthly performances and multi-media events community art events. The 2,000 square foot gallery features ten exhibitions annually. Ellarslie presents permanent and special exhibits of Trenton’s historical artifacts and industrial products, particularly pottery and porcelain, as well as works by local artists. The museum is surrounded by a beautiful park designed by Frederick Law Olmsted. Group tours require a reservation. The capitol since 1792, the State House is New Jersey’s most historic public building. Today, it houses the executive and legislative branches of government. It includes magnificently restored chambers and is a “must see” for anyone interested in civics and architecture. Guided tours of the capital building are given Monday through Friday. Groups of over ten and all school groups require advance reservations. For springtime visits, we recommend reserving nine months in advance. The Old Barracks Museum offers unique and quality programs to visiting groups. Meet the Past programs, Battle of Trenton and New Jersey Divided, are 60-minute programs, using first person interpretation to introduce and immerse visitors into life in 1777 New Jersey. A Call to Arms Workshop, a 150-minute program, is offered to children ages 9 and up. This workshop gives groups an intensive and individual approach to Continental Army life. Middle schoolers assume the roles of historians, architects, and archaeologists in our History Lab. Outreach programs for individual classes and assembly programs are also available. The Trenton War Memorial, the state’s official monument to all New Jerseyans who served in the Armed Forces of the United States, was built in 1932. The 1800 seat Patriots Theater within the War Memorial is widely known as a premiere center for the performing arts. Patriots Theater is host to many educational programs presented by various organizations including The New Jersey Symphony Orchestra, Theatre Works, The Greater Trenton Symphony Orchestra and Chamber Theatre. An architectural treasure listed on the National Register and the State Register of Historic Sites, the War Memorial was reopened in 1999 following a $35 million restoration and renovation by the State of New Jersey. The War Memorial also houses a Militia Museum, an art deco ballroom and several other beautiful and historic rooms. Tours of the building are free. Call the number above to arrange a tour. The 1719 home of William Trent is available for guided "empty house" tours. Students will learn about the life and times of various members of the Trent household while they participate in activities such as colonial era games, carding wool, grinding herbs or trying on clothing. City of Trenton schools may schedule colonial era themed classroom sessions for 4th grade students. Reservations required for all group tours and in-school programs. Trenton will explode with events that both commemorate the patriots who fought for American independence and honor the ideals of the Revolution that thrive today.